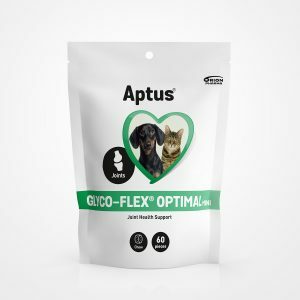 Contains a skin health promoting combination of EPA, DHA, and GLA (omega-3 and 6 fatty acids), amino acids, zinc, and vitamins. Developed for dogs with skin related problems, such as itching, flaking, and redness. Tasty chicken flavoured chews. 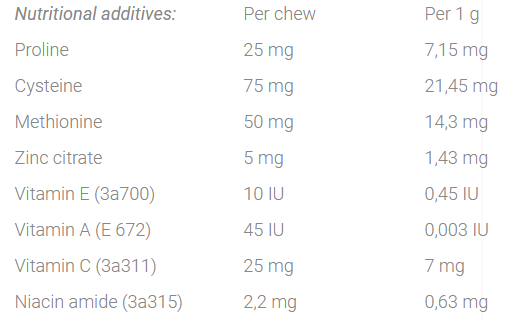 Give the chews daily as treats or mix with food. Multiple chews can be divided into morning and evening portions. 1 chew / 10 kg of body weight daily. Maximum of 4 chews per day. 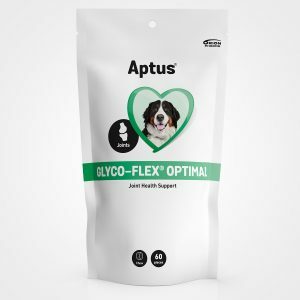 Brewers’ yeast, borage oil, vegetable-based chicken flavour (5%), glycerine, methylsulphonylmethane (MSM), fish oil concentrate, grape seed extract (0,4%), perilla seed extract (0,3%), hyaluronic acid (0,1%). 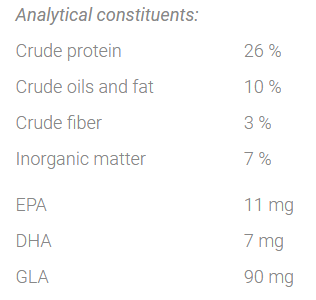 Emulsifier (soya lecithin), anti-caking agent (silicon dioxide), thickener (maltodextrin, sodium alginate, calcium sulphate), preservatives (natural tocopherols, propionic acid). 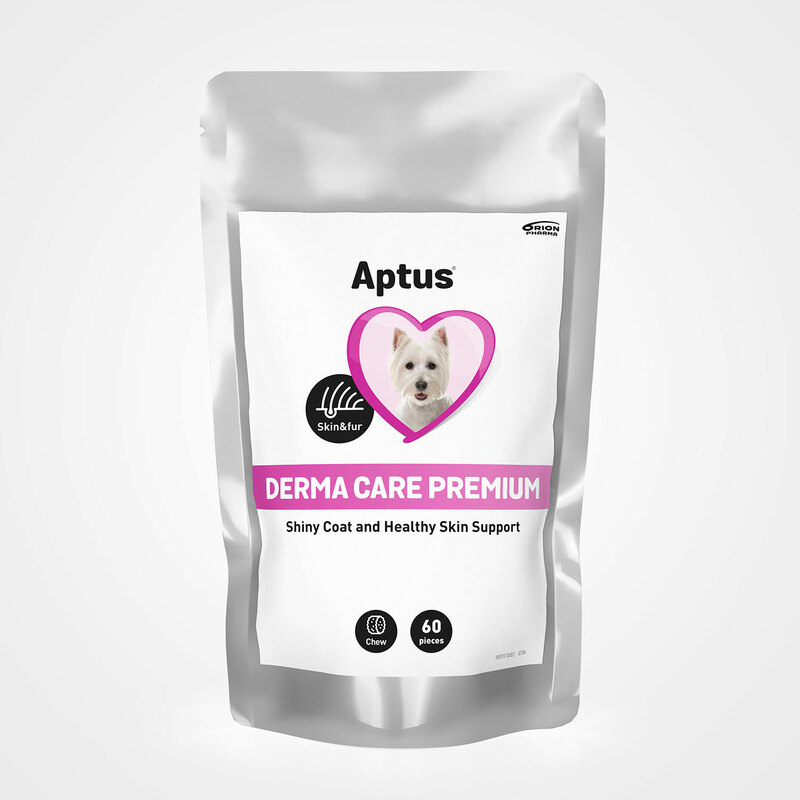 Aptus Derma Care Premium is a combination of several skin health supporting ingredients. Omega-3 and 6 fatty acids nourish and moisturize the skin promoting healthy skin and a shiny coat. They also have anti-inflammatory properties. 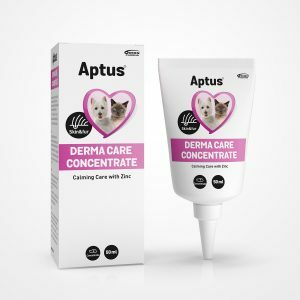 Amino acids cysteine, methionine and proline strengthen, renew and rebuild proteins in skin and fur cells. Zinc is a mineral with several skin health promoting properties. It is also known for its anti-inflammatory effects. Vitamins A, C, and E act as antioxidants and have skin balancing and/or nourishing properties. Deficiency of niacinamide (vitamin B3) can lead to skin disorders. Hyaluronic acid is an efficient moisturizer preventing dryness.